Fasting is a voluntary act of reduction of certain foods and drinks for a specific period of time. But are you aware that it helps in building internal strength too? Yes, you read that right! Fasting controls appetite, increases will power, and improves moral conduct, all of which are markers for good mental health. Spiritual fasting during Ramadan is treated as an act of obedience that empowers an individual’s spiritual side. It strengthens powers of self-control and prevents wrongful desires. It also improves self-restraint, which is basically the ability to control actions and emotions. During fasting, an individual is refrained from acting upon natural human urges. Different people have different levels of tolerance to stress and strain. Fasting helps people gain good control over their emotions. Fasting improves mental clarity and focus and can instill peace and calmness. Islam believes that besides helping with self control for food and drink, fasting also helps build character. An individual who fasts is also expected to control harsh talk, verbal abuse, and prevent expressing dislike to other fellow human beings. Therefore, fasting can help improve moral conduct and behavior too. Ramadan brings peace and heightens spiritual awareness. During this phase people conquer their craving for food, water, and other worldly pleasures. 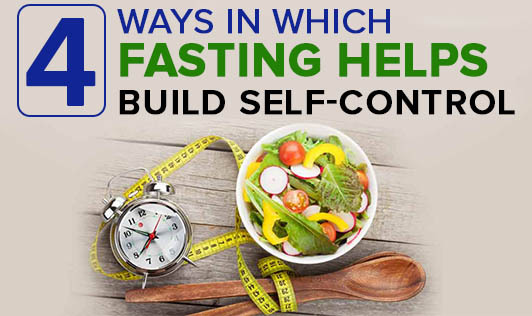 Fasting strives to bring about self-control and eradicates negative thoughts and emotions, the fruits of which though not immediately noticeable, will definitely be experienced over time.